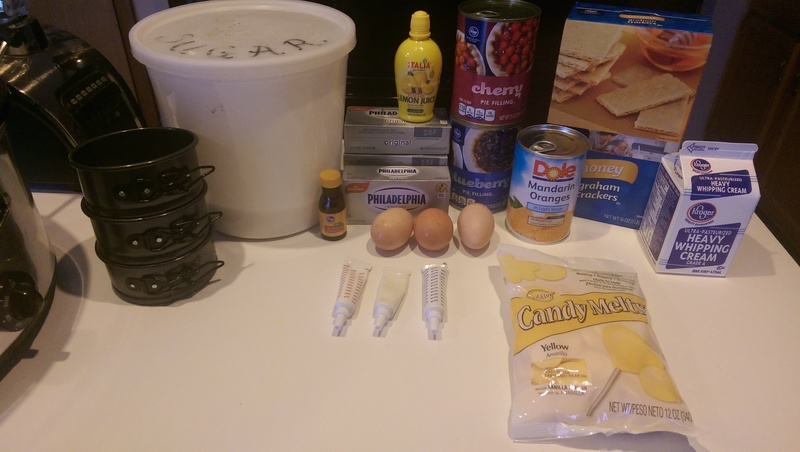 1 cup cookies, crushed – I used graham crackers, but you could also try chocolate wafer cookies, Nilla Wafers, pick your favorite. Preheat your oven to 325 degrees F. In a small bowl, combine your crust ingredients and mix well. 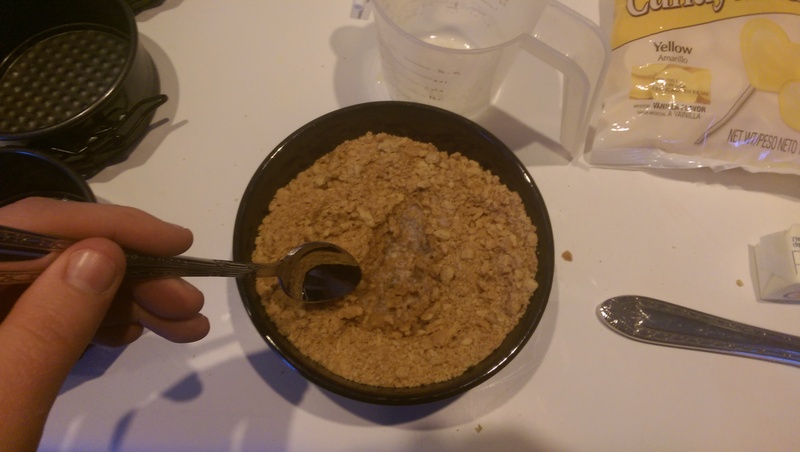 The end result should be a bowl of thoroughly moistened crumbs. 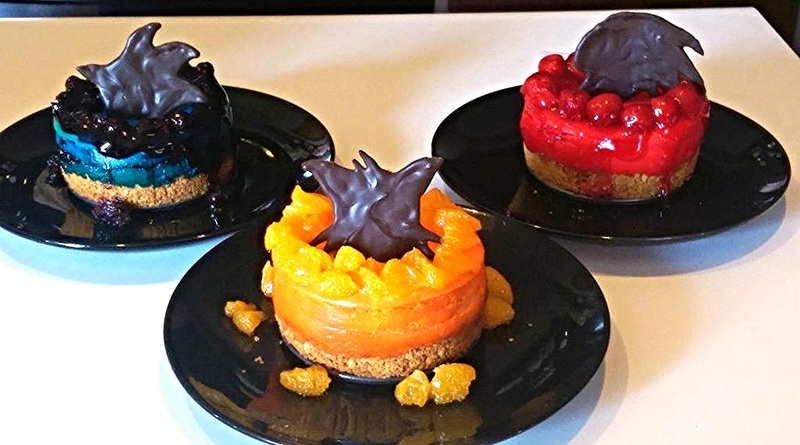 This recipe will give you three beautiful, individual sized cakes. Divide your crust mixture into three small springform pans and press into the bottoms and sides of the pans. I found that pressing the crust up just a few centimeters up the sides was just fine (admittedly, not a crust fan). You’ll want to use your fingers for best effect. Set these aside. 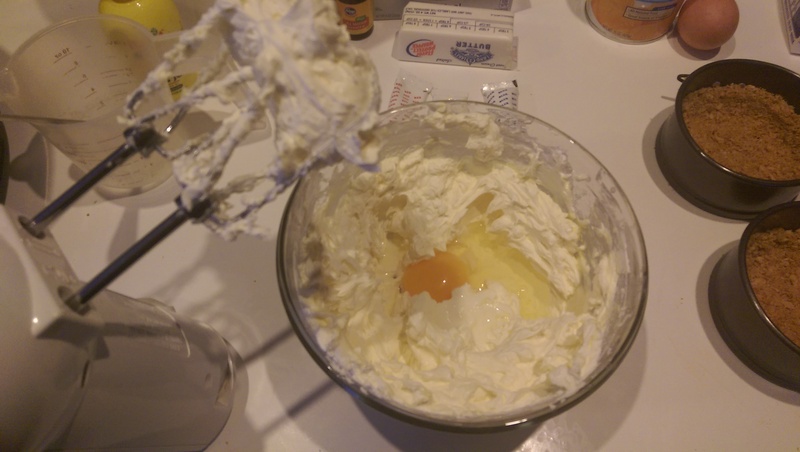 In a large bowl, beat your cream cheese with an electric hand mixer on medium speed until smooth. For the love of all that’s holy, turn the mixer off before removing buildup from the blades. Now, if you intend to make plain cheesecakes, add 1 teaspoon of lemon juice now. If you plan on three flavors like me, follow the instructions listed below. 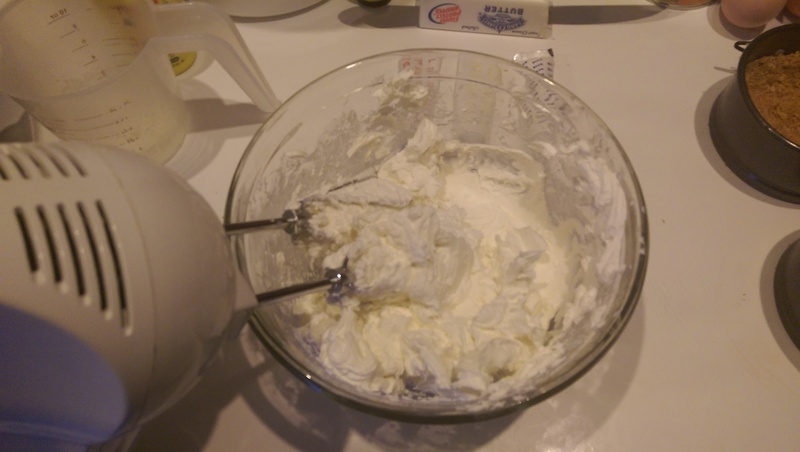 Beat in sugar until smooth, then add your whipping cream and blend well. Time to get fancy. 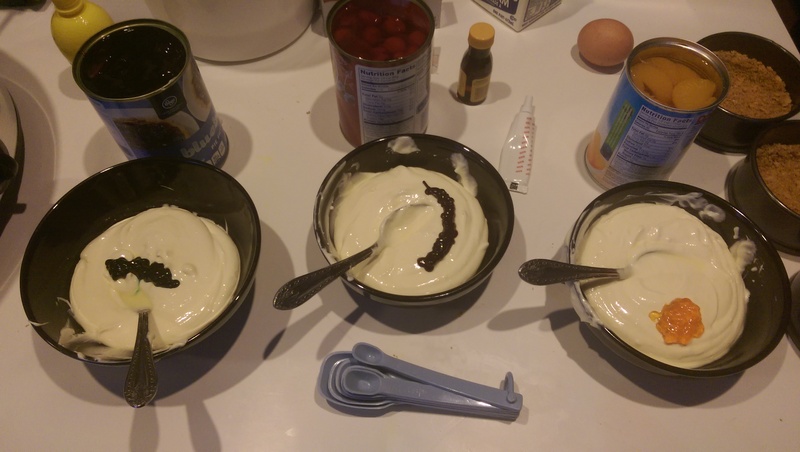 Divide your cheesecake mixture evenly into three small bowls. 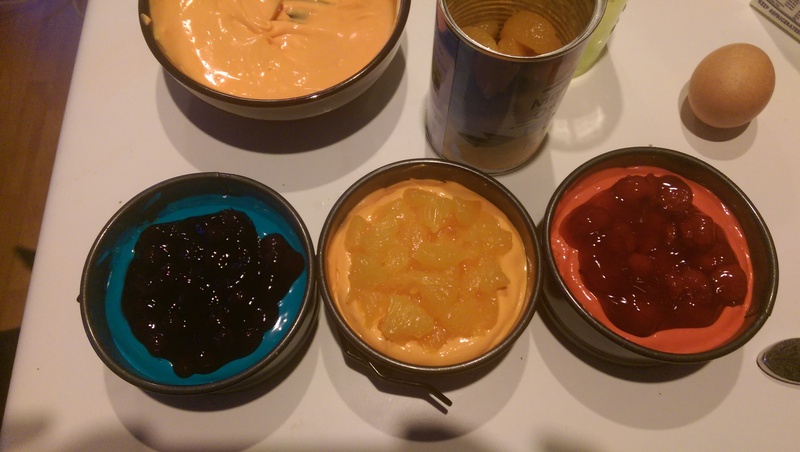 For Tails: Add 1/8 teaspoon lemon juice and your entire tube of yellow gel food coloring. 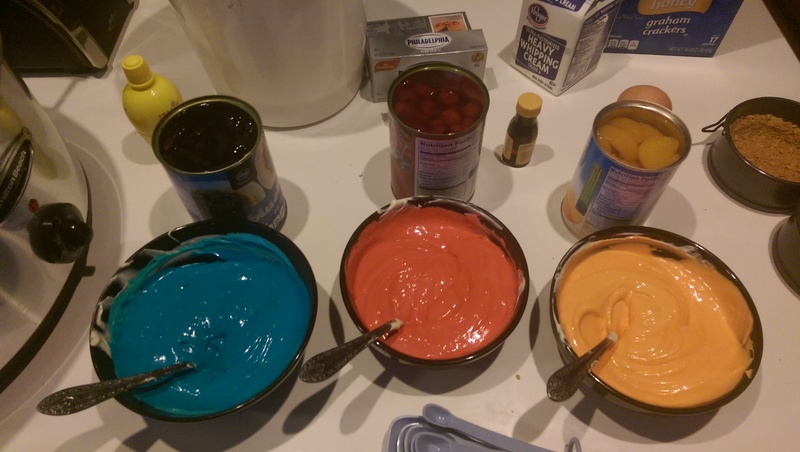 Add about two small squirts of red food coloring, then mix well. Add a smidgen of extra red if necessary for that nice orange color. You really don’t need much red coloring; best add a bit, stir, add more as necessary and stir. For Knuckles: Add 1/8 teaspoon almond extract and the rest of your red gel food coloring and mix well until well combined. Pre-mixing. Sonic at left, Knuckles at center, Tails at right. 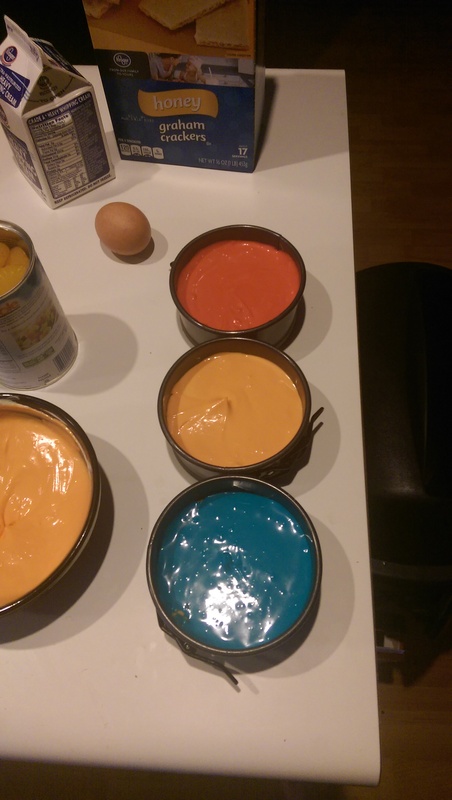 Opened cans of filling because I couldn’t tell the difference between the red and blue before mixing. 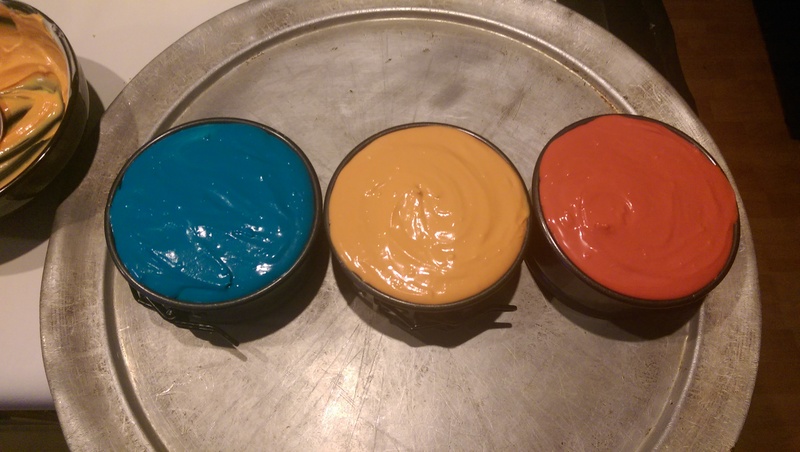 Naturally, please use one spoon per color to avoid color mixing. Ew. Post mixing. See? I promise I had a plan all along! 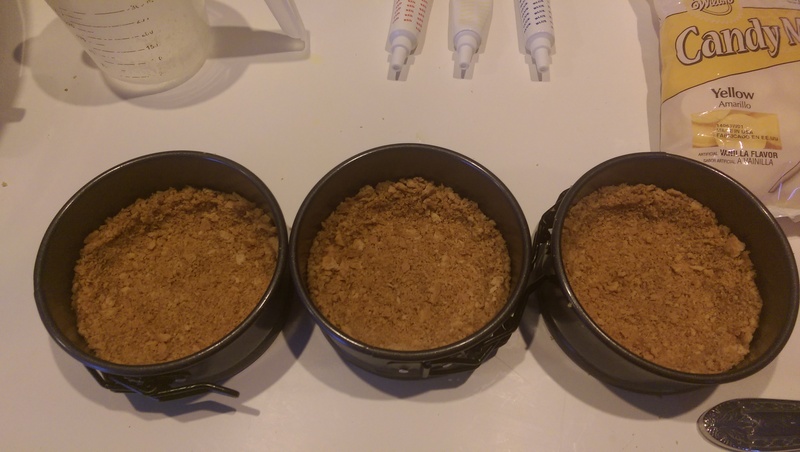 If you’re making plain cheesecakes, transfer your entire cheesecake mixture into your springform pans now. Fruit lovers, I’m talking to you now: add just a little under half of your cheesecake mixture to your pans and gently spread over crust with a spoon. Slowly add a few spoonfuls of filling to your cheesecakes and be very careful not to let your fillings touch the edges of the pan. It’s going to get rather messy later if you choose to ignore this step. See how some of the Sonic blueberry filling went a little wonky on the right? Yeah, that’s gonna be messy. Dammit. Add the rest of your cheesecake mixture and fill to the top of your pans. Probably a little too full, but I tend to learn this lesson the hard way, don’t I. So far so good. Transfer your springform pans to a larger baking tray (don’t judge my pizza pan) and bake for 40-50 minutes, until the center of your cakes are set. Mine rose a bit in the oven but settled as they cooled. I know you want to, but don’t touch. Allow your cheesecakes to cool in the springform pans for an hour. While you’re waiting, melt some chocolate Candy Melts in the microwave and transfer to a piping bag or sandwich baggie. 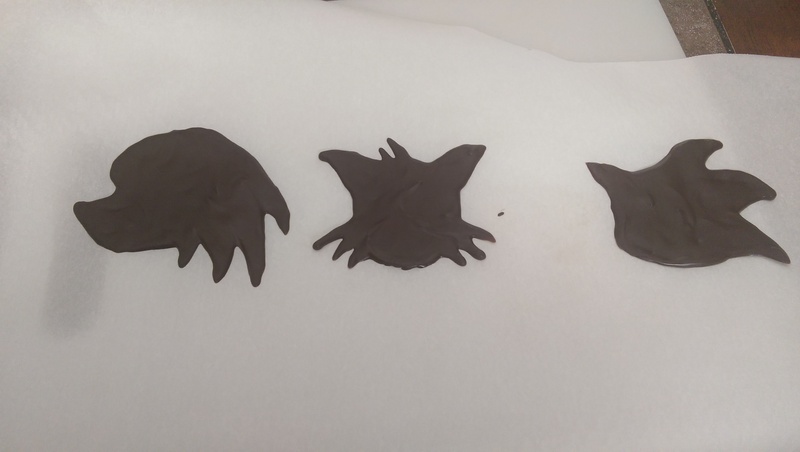 Pipe little chocolate Sonic, Knuckles, and Tails silhouette heads onto parchment or wax paper. Allow these to cool in the freezer until you decorate. 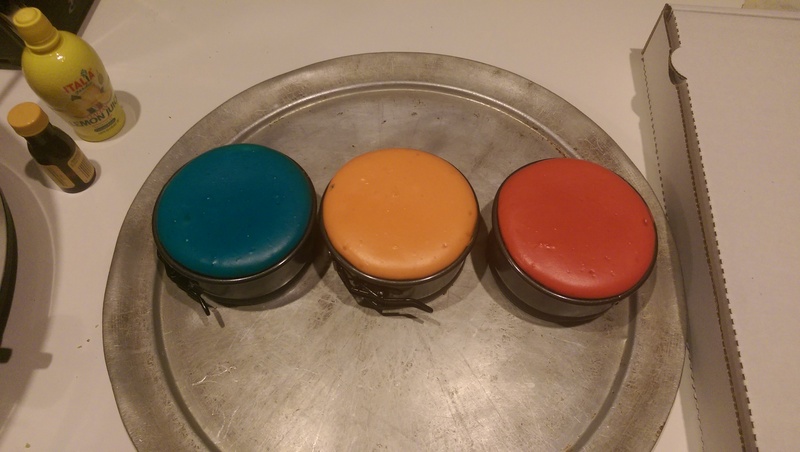 Undo the clasps on your springform pans and gently ease your cheesecakes out onto a plate. Chill for at least three hours or overnight. Serve with chocolate toppers and pie filling, as desired. One question remains: Which cheesecake reigns supreme? Good luck deciding. Absolutely divine. Who knew Sonic was so darn classy? The little fruity surprises in the middle of mine were to. die. for. OMG. Without a question, worthy of a special occasion. As always, please tell me what you think! I love hearing what all of you have to say every week. Previous PostSuper Mario Bros. Lemony Super Star Cookies. Let’s skip the clever witticisms – YUM, YUM, & YUM!Next PostHearthstone Rock Candy Geodes – So That’s Where the Mana Gems come from!